Lemon curd is one of the greatest inventions on Earth. I love it because it’s refreshingly sweet & tart at the same time. Making it yourself may sound intimidating enough that you’d opt for store-bought ones in the supermarket. 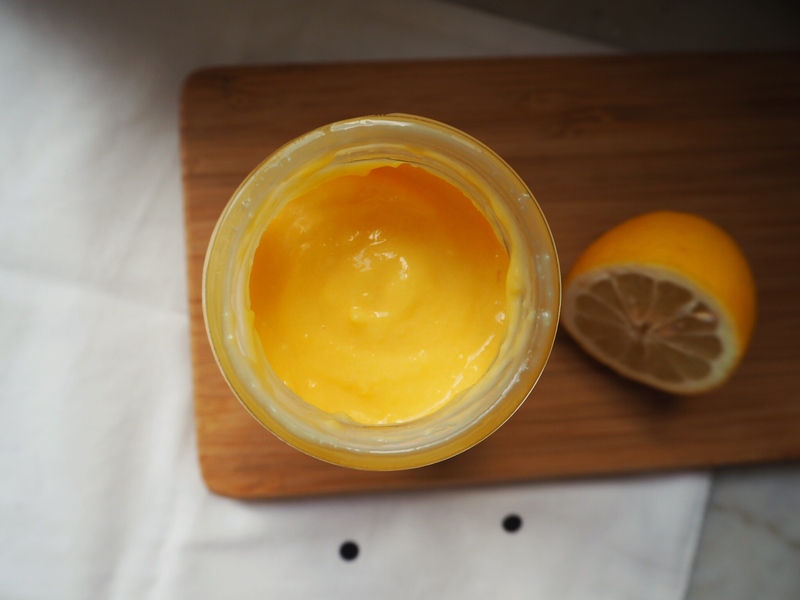 But let me get this straight – making lemon curd yourself only sounds sophisticated – it’s actually SO very easy. In fact, you might start thinking about giving away jars and jars of lemon curd to your friends, family or even your neighbours whenever the occasion calls for it LOL. This delicious and simple recipe is by Cupcake Jemma. I first came across her when I was searching for cupcake videos on YouTube. The cupcakes she made in her videos looked so good that I finally overcame my irrational fear of making them, and made my first round as soon as I could (but let’s leave that for next time). I absolutely admire her, for her unquestionable talent in baking, self-confidence, beauty, and tattoos. She has simplified the making process so much that I couldn’t wait to give it a go. And you know what? She didn’t lie; it’s just that simple. Once you have made a whole jar of lemon curd (applause! ), there are limitless things you can do with it. Stay tuned, as for the next few blog posts, I am going to share some of my fav lemon curd dessert recipes with you all! Prepare a double boiler. To do so, fill a saucepan with 1-1.5 inches high of water and bring it to simmer. Find a heatproof bowl that fits in the saucepan without directly touching the water. Put all ingredients except the butter into the heatproof bowl. Using a whisk, stir the mixture continuously but gently to slowly cook the eggs. The lemon curd is ready when it starts to thicken up. This process will take about 5-7 mins. Remove the bowl from the saucepan. Stir in the cold chopped butter into the mixture. Mix until the butter completely melts. Put the lemon curd into an airtight container and store in the fridge for up to 2 weeks. Enjoy! *You may sieve the lemon curd if you want a creamier texture, just remember that you only add the lemon zest in the end. As you said its really a greatest invention on earth….love it to the core 😍!!! Your pics made me to carve for the lemon curd ☺️….gonna whip that up soon!! !